Flexible musical accompaniment: solo piano, solo organ, baroque orchestra, etc. As they enter, audience members are invited to light a candle in rememberance of a loved one. Candles remain in view for the duration of the performance. ​... a time to die ... a time to weep ... a time to mourn, and a time to dance." 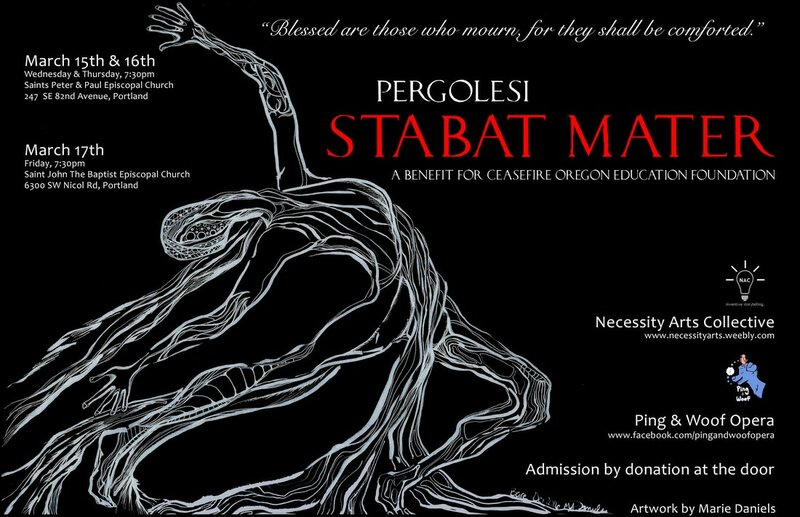 PORTLAND, OR, March 15-17, 2017 - Portland-based opera company Ping & Woof has joined forces with the newly arrived dance ensemble Necessity Arts Collective (NAC) for their annual performance of Pergolesi's Stabat Mater. This event is a benefit concert for Ceasefire Oregon Education Foundation (COEF): a local organization that works to reduce the number of gun injuries and deaths in Oregon by educating the public and providing opportunities to dispose of unwanted firearms. The mutual desire to make the Arts accessible while actively serving the community – especially during these politically challenging times – drew Ping & Woof and NAC into collaboration. Members of both companies discussed several charities that deal with grief and loss as potential beneficiaries for this project, to which all participants have donated their time and effort. COEF emerged as a favorite because it addresses multiple causes about which the different artists care deeply. Chief among these is suicide prevention, which heavily affects veterans and those suffering from mental illness. According to the Ceasefire Oregon website, “When most people think of gun violence, they think of homicides or unintentional shootings. The reality, however, is that most shooting deaths in Oregon are suicides. In fact, about one person a day commits suicide with a gun in Oregon.” 44% of these people are reportedly in a depressed mood, and one third of them have been diagnosed with a mental illness; most of them are white males over age 65. In addition, the suicide rate among Oregon veterans ages 18 – 24 is nearly 10 times that of their non-veteran peers. COEF educates the public about gun violence in effort to stop these unnecessary tragedies. Their work focuses on improving standards for gun ownership, enhancing accountability of federally licensed firearm dealers, and improving safety standards for guns and gun ownership. Their website presents such helpful information as “How to Talk about Gun Safety” and a brochure that informs teachers about preventing student suicide. A representative of COEF will be present at all three performances to answer questions from the audience. Ping & Woof has performed Giovanni Battista Pergolesi's Stabat Mater (1736) during the season of Lent annually since 2014. The piece is based on an ancient Latin text which describes the passion of Christ as seen through the eyes of his mother Mary. In this version, Jocelyn Claire Thomas (soprano), Beth Madsen-Bradford (mezzo-soprano) and Brian Thomas (pianist) are joined by contemporary dancers Reid Bondurant, Kasandra Martinez, Hannah MacKenzie-Margulies, Claire Thomforde-Garner and Amelia Unsicker. The dancers, directed by Hayley Glickfeld Bielman, do not interpret the text literally but rather present a more general expression of grief that ranges from denial, anger and guilt, to memory and questioning, and finally acceptance. Much of the movement is inspired by ritual. Both the music and the opportunity to cope artistically with some recent personal losses spoke to director Glickfeld Bielman. “It is intimidating to face mortality, fear of the unknown, the hurt of loss – but these are integral to the human experience,” she says. “Dance is a beautiful medium for capturing and expressing these innate emotions that we are often afraid to put into words.” The piece came together in an unusually harmonious collaborative process between artists of different religious inclinations. Glickfeld Bielman observes, “Despite the gravity of the piece, we have spent a lot of time laughing during rehearsals. Creating this work has been a joyful experience.” The performers look forward to comforting those who mourn with Stabat Mater, both during the show and through their contribution to COEF.